For a 50-year-old, this film still has great legs. It's certainly not without its shortcomings, but this new HD remaster shows off the original material to maximum impact with pristine, vibrant image quality and a new 7.1 DTS-HD soundtrack. The bonus features don't go much beyond what was previously available on DVD, but completists will appreciate the newest interview footage included here. The story is an update of Romeo and Juliet, transposing the action to the mean streets of mid-20th century New York where rival gangs face off against each other in racially-charged encounters on the pavement and the dance floor. Juliet is now a Puerto Rican played by non-Puerto Rican Natalie Wood, while Romeo is a tall Polish gang member played by Richard Beymer. When they meet, their forbidden love triggers an all-out gang war ending in tragedy. The story may be timeless, but it's not very impressive in this setting. Its lead actors have no chemistry, little dance talent, and are the least notable members of the cast. It's also difficult to reconcile the idea of tough gang members breaking out into occasionally effeminate song, dance, and fight numbers. As a result, the film's narrative as a whole doesn't really connect, but it's buoyed by such amazing technical mastery that the total package is still in a league of its own. There are two principal stars here, and they're not Wood and Beymer, the two leads tasked with embodying the updated Romeo and Juliet characters Tony and Maria. No, this film primarily owes its ongoing legacy to composer Leonard Bernstein and choreographer/co-director Jerome Robbins, two American icons who contributed innovative work to the project. Bernstein's score and songs (with lyrics by Stephen Sondheim) marry distinctly Latin touches with his orchestral sweep, and it's amazing to consider how iconic and familiar most of the work is a half century after its creation. Meanwhile, although I couldn't buy the gang members breaking into ballet twirls, Robbins crafted such spectacular dance numbers that it's no surprise to learn of the countless weeks and cast injuries sustained to capture them on film. It's also not surprising to learn that he went over budget and schedule due to his perfectionism and was replaced as director by The Sound of Music director Robert Wise midway through the shoot. As for the other performances, the secondary lead roles are completely mesmerizing as played by Rita Moreno (Anita) and Russ Tamblyn (Riff) thanks to their amazing physicality, while George Chakiris as the Puerto Rican gang leader Bernardo also impresses with his passionate dance moves and acting. The 3-disc Blu-ray/DVD combo package includes the film in Blu-ray on the first disc, bonus Blu-ray special features on the second disc, and a DVD copy of the film and selected repeat bonus features on the third disc. 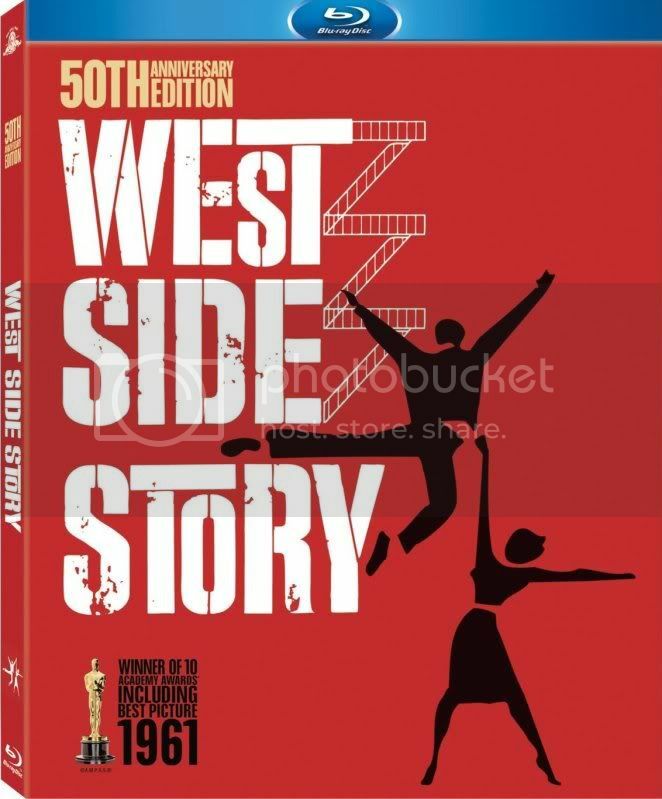 The bonus features are headlined by a new retrospective including interviews with select cast members and assorted creators inspired by the film and original Broadway musical, which oddly doesn't include any of the three surviving principal cast members but does include interviews with original Broadway star Chita Rivera and Broadway revival star Debbie Allen. It's a fairly lightweight supplement that is more of a self-congratulatory pat on the back than an exploration of the film's legacy. Far better is the older supplement West Side Memories created for DVD years ago, as it does feature interviews with Beymer, Moreno, and Tamblyn and reveals some of the trials and tribulations undertaken to bring the story to screen.